Here’s my take on Dust: Jessie is full of resentment, having died young in a car accident. Besides dying Jessie lost an arm and Jessie turned zombie. When Jessie was alive Jessie was a vegan – but now in Jessie’s undead form – Jessie works with a gang of bitter former humans (don’t call them zombies) that eat free range and organic animals like squirrels, possum and deer. Jessie and her associates communicate telepathically (because their mouths don’t make speech very well anymore). The undead very frequently address Jessie by her first name, which is Jessie. Jessie has many indignant conversations with her fellow embittered undead. They often punctuate their sentences with kicks, shoves and punches that break each other’s bones and dislodge sloughing off flesh. This is to be expected for Jessie. Despite these seemingly acrimonious interactions Jessie seems to love and respect her spiteful companions. They all share Jessie’s disdain for the un-undead (living people). Jessie and her surly companions have a hard life, having to deal with maggots, bloating and living out of doors all-year round. Then, after we understand Jessie well enough, Jessie’s living brother turns up, he’s interested in making peace with Jessie. But, Jessie isn’t having any of it. Jessie thinks he’s just a stupid “hoo” (that’s what Jessie and her friends call living humans). Jessie’s brother has a story to tell, but Jessie isn’t really willing to hear it. Next, a disease starts plaguing some of Jessie’s companions. Jessie thinks this is bad, but typical. Jessie also discovers something bad is happening to the stupid hoos. Jessie thinks that is what they get for being stupid hoos. But then the bad thing that hurts Jessie’s friends is something that turns the undead into less-rotty versions of themselves Jessie is angry. Jessie resents that her severed arm regrows. Jessie doesn’t want to look like a stupid hoo. The disease makes Jessie and everyone, even the stupid hoos, very hungry. That is bad, for Jessie, but deserving for the stupid hoos. The end (for Jesse). You may be able to tell that I intensely disliked this novel. It was well written, with clear exposition, and it has clearly delineated story. Unfortunately Dust taught me nothing except that a clear exposition of the disagreeable does not improve it much. If you’re not teaching me anything, at least make the book fun. My dislike of Dust also stems from the fact that it posits multiple gimmes (a singular central conceit which may remain unexamined). Dust lets the reader assume nothing, the ground-rules aren’t fixed, and new rules are seemingly arbitrarily added on every tenth page. This means I, as a reader, cannot participate in the world of the book as much as sit back and observe what the author does with it. That is not fun. 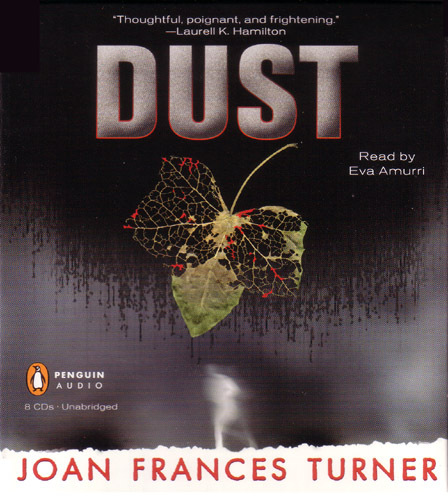 Based on the clarity of Dust I expect that Joan Frances Turner is capable of writing a fine novel, one that explores something more fruitful than resentment (which I will admit is a way to go with a zombie story told from the perspective of a zombie). But the zombie novel, as a phenomenon, may also be the problem. It may be time for people to stop writing stories from the perspective of a zombie. From my perspective Dust puts the final nail in the coffin of zombie stories told from the zombie’s perspective. 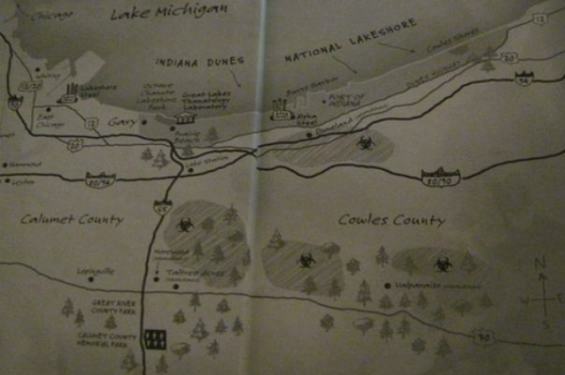 The audiobook of Dust does not contain the handy map that’s in the paperbook’s endpapers. Turner herself writes on her blog saying “the geography of the book is so vital to the story.” As to the narrator, typically when a narrator isn’t doing it for me I start looking for notable defects – asking myself “what is it that specifically bugs me about the narration?” Often this delivers some sort of gripe, like bad word pronunciation, an unconvincing accent or improper emphasis in important passages. I thought I spotted one badly pronounced word (“onerous”), but as it turns out, at least according to the Dictionary.com pronunciation guide, it is I who had been pronouncing “onerous” wrong! 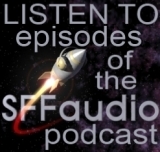 That said, Eva Amurri’s narration still doesn’t work for me. I’m not sure why. Other reviewers have praised her performance.